You will earn 12,073 Reward Points. Earn 1 reward point for every 1 dollar spent. 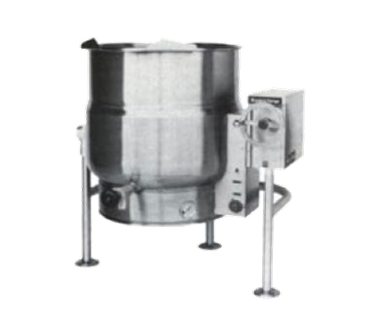 Market Forge Self-generating electric, tri-leg, steam jacketed kettle. Kettle will be constructed of welded satin finish, stainless steel type 304. 20, 30 and 40-gallon kettles have 316 type stainless steel as standard. A double wall kettle interior will form a steam jacket around the lower 2/3 of the kettle. The jacket will enclose heat elements (Which will be easily removable for service), water and antifreeze design for superior heat distribution. Unit will be mounted on a stainless steel tri-leg pipe fitted legs and adjustable flanged feet with four holes for securing kettle to floor.